An outdoor garden structure such as a summer house or gazebo becomes a unique retreat from the stress of daily life. Many such structures are utilized as studios for writing, painting or crafting interests, or can simply become a space for you to relax and enjoy a leisure period. 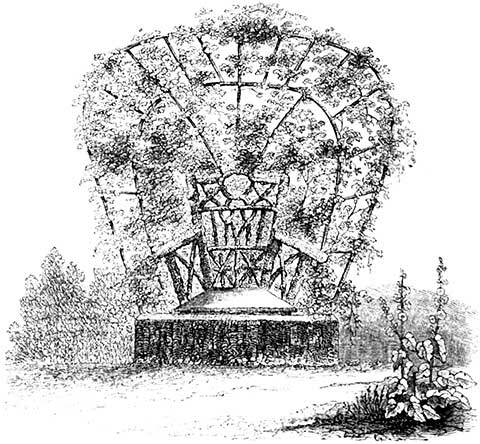 The picture below is an antebellum outdoor garden structure featured in 1852 and was designed specifically for an antebellum plantation landscape. At the time, it was suggested that the grand summer house, styled like today’s scenic outdoor gazebo, be placed on the border of an elevated wood area or a picturesque tree grove at a short distance from the residence. Here the summer house would provide a resting place and shelter from heat or rain. 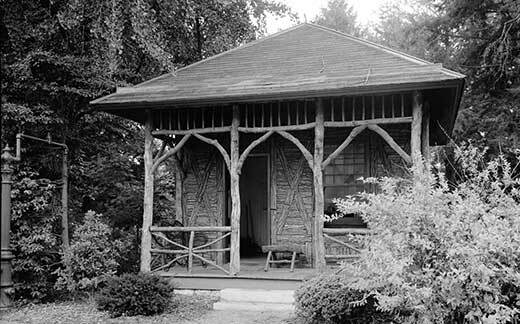 The summer house was composed chiefly of unbarked wood, commonly the refuse of felled trees that was cut into square timbers for the carpenter. The various sizes of planks and pieces in conjunction with the color and texture of the bark when contrasted with the dark browns and yellow hues of the cut surfaces of the timber, afforded ample means for an effective display on the basic framework of the garden structure. The upper roof of the summer house was covered with reed thatching. 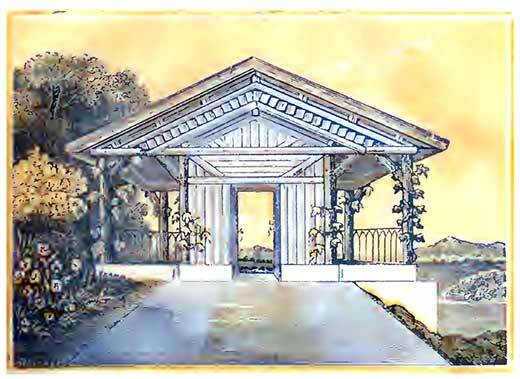 This 1850s rustic pavilion was intended as an embellishment to a plantation and to form an open a spacious retreat covered enclosure at the intersection of a long and straight pathway of an elevated terrace garden. Several buildings thus placed, and at proper distances, produced a pleasant vista and were particularly useful and ornamental in newly made mid-19th century plantations. The trunks and arms of trees that retained their bark were the simple materials of which the building was erected. The outdoor enclosure roof was covered with reed thatching; the ceiling and walls covered with a warm drab color. 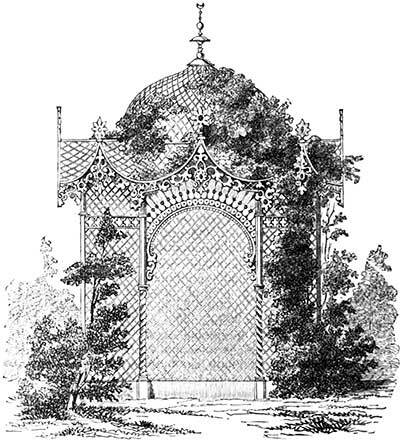 This garden summer house or gazebo was featured in The Horticulturist in 1855. 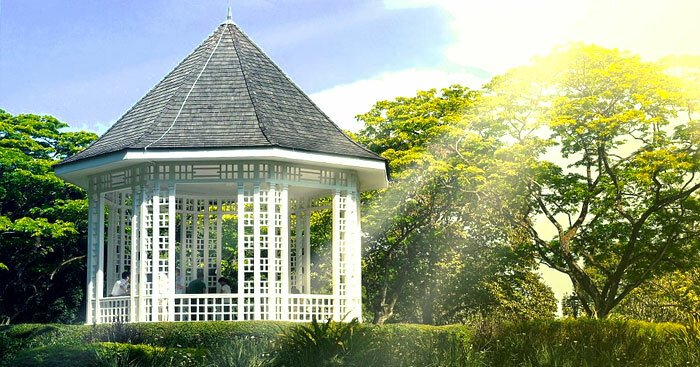 The gazebo is extremely ornate and only appropriate in a sculptured garden landscape in a country residence with an impressive plantation or ornate villa. The garden summer gazebo is well adapted for running vines. 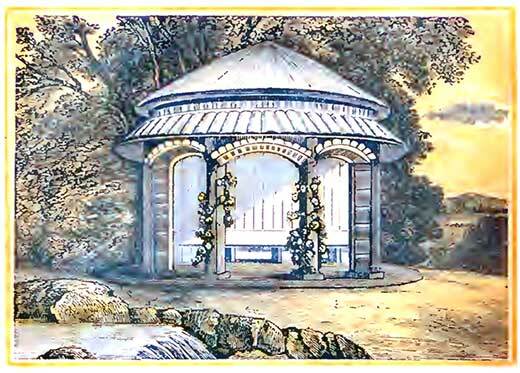 This is a similar garden gazebo structure on Rosedown Plantation. No house in Louisiana gives a better idea of an old Louisiana plantation home than does Rosedown, with its first structure built at the end of an avenue of oaks in 1835. Between these oaks is a marble statuary, copies of well-known classical works bought in Italy by the Turnbulls in 1851. On each side of the avenue is a garden laid out in a Victorian manner reminiscent of the French naturalistic gardens of that date. 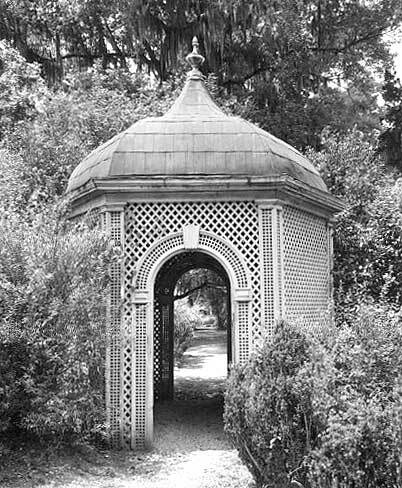 Don’t have a southern plantation or grand estate to build a ornate garden covered enclosure like the ones featured? Create your own garden hideaway like this mid-19th century garden seat. This covered rural seat is ornamented with Irish Ivy which grows rapidly, soon covering the lattice-work bower enveloping the seat.